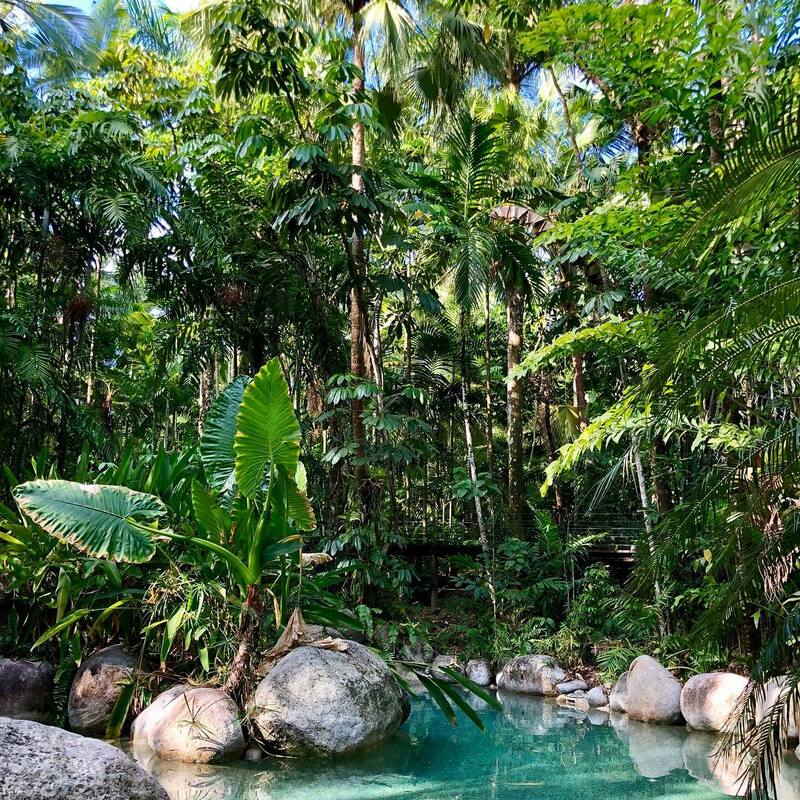 Attracting crowds of up to 400,000 each year, Daintree Rainforest is quickly becoming one of Australia’s key natural sights. 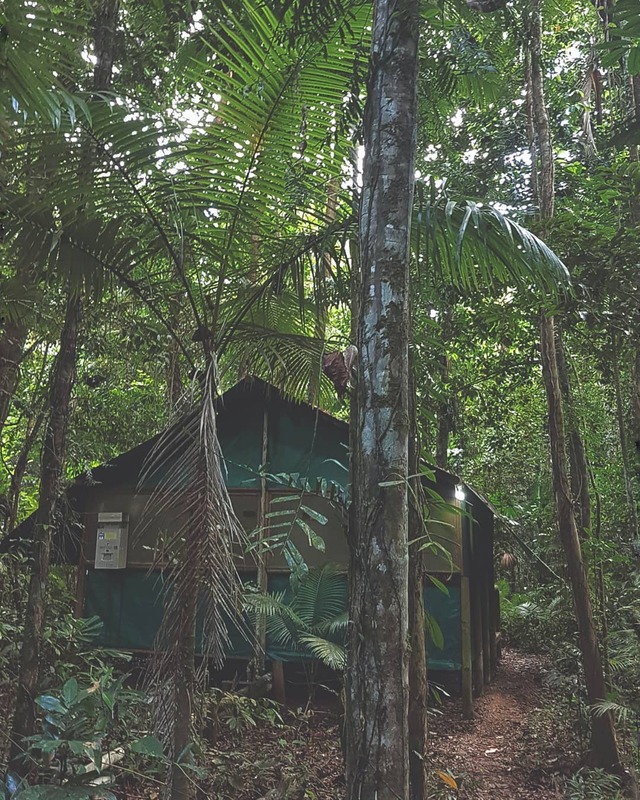 With hikes, tours, retreats, and conservation all in arm’s reach, travelers come from near and far to relish in the sublime beauty of Daintree Rainforest – the oldest continuously surviving tropical rainforest in the world. Here you can trek through the jungle and discover plants and animals found nowhere else on the planet. Named after Australia’s pioneering geologist and photographer, Richard Daintree. The Daintree Rainforest was listed as a World Heritage site in 1988 and is protected by the Daintree National Park. Estimated at being over one hundred and thirty-five million years old. The Daintree rainforest is home to some of the most primitive plants in the world. Amongst the tropical surroundings of the Daintree Rainforest live at least 430 species of birds. 13 of which are endemic, and unique animals such as the endangered Southern Cassowary, the White-Lipped Frog, Boyd’s Forest Dragon, and the native Australian Platypus. 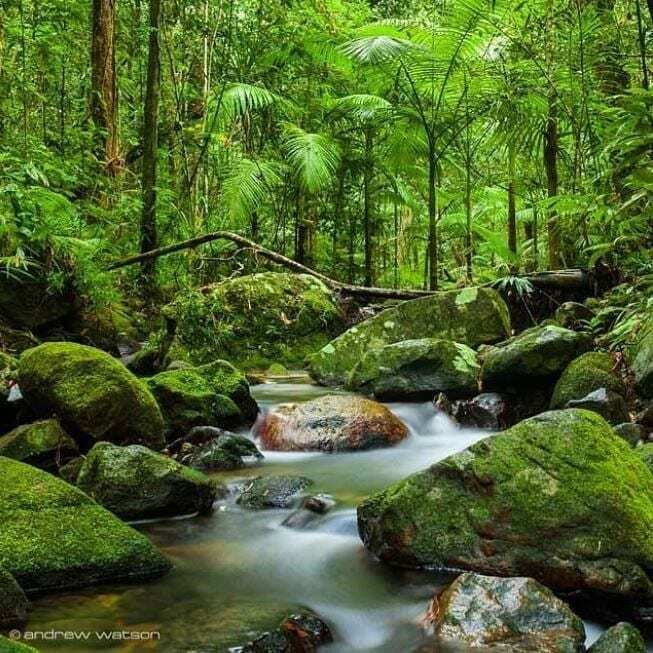 The Daintree Rainforest is a living breathing museum of flora and fauna which we need to continue to protect and preserve for millions of years to come. Situated north of Cairns. Getting to the Daintree Rainforest is an easy drive along the Captain Cook Highway, passing through Port Douglas and Mossman. All the way to the Daintree River ferry. Crossing the Daintree River via regular trips from 6 am until midnight. The ferry is the gateway to one of the world’s most scenic drives: the journey to Cape Tribulation. Similarity, north of the Daintree Rainforest, Cooktown is another popular holiday destination from which this region is accessed. It requires a 4WD vehicle in order to drive along this coast road. From Cooktown, it’s a 75km drive to the Bloomfield River. Getting to the Daintree Rainforest from here is possible in any kind of car as the road is surfaced by gravel. Once a world-class walking the track, the road now allows vehicles to pass through the region for access to the Daintree Rainforest while enjoying the scenery. There’s not an abundance of accommodation options in Daintree Village. That’s why we recommend you book well in advance before you make the trip out there. There is a range of eco-friendly lodges as well as self-contained cabins, small bed and breakfasts, and motels. Once you get over the Daintree River you will find a number of accommodation options around Cape Tribulation Beach. There are many resting places such as hostels, backpackers and motels for the budget conscious and more upscale holiday houses, resorts and boutique lodges. Or you can choose to stay in a tree house perched high above the rainforest at Silky Oaks Lodge, spectacularly located overlooking the Mossman River. The lodge offers a range of activities from helicopter tours to hot air ballooning. It also has an award-winning on-site spa that specializes in natural therapies; it’s even a member of the prestigious Luxury Lodges of Australia. The Daintree Rainforest is home for a great many weird and wonderful critters. There’s the White-lipped Tree Frog, the world largest tree frog, which sometimes barks like a dog and sometimes mews like a cat. There’s also the Ulysses Butterfly, a bright metallic blue rainforest flyer with a wingspan of 14 centimeters across. Then there’s the Bennett’s Tree Kangaroo, a small tree-climbing marsupial that’s kinda as close as any marsupial gets to being a monkey. The impressively massive Cassowary also lives here, with its brightly colored neck and idiosyncratic behaviors. At around 1,200 square kilometers, this is the largest contiguous area of rainforest in Australia. This is large as New York City, and approximately 14 times the size of the island of Manhattan. The entire Wet Tropics world heritage area as a whole is a massive 12,000 square kilometers. This is more than 16 times the size of the island of Singapore, an area of the world home to five and a half million people. Australia is a notoriously dry continent. It is famous as a land of droughts and deserts and shifting, sun-blasted sands. The facts support this popular image too: it’s the driest of all the continents that support human settlement, with only Antarctica being drier. The Daintree Rainforest, however, is a very rainy exception to this parched rule. It gets an average of 2013 mm of rain every year. This is more rain than London gets in three years. The stunning array of spectacular plants and animals of the Daintree Rainforest includes some terrifically tall trees. The Bull Kauri is one, a very rare conifer endemic to north Queensland and threatened by habitat loss. The Daintree Rainforest is home to a couple of these trees that stand over 40 meters. The tallest of these is 44.2 meters tall, which is roughly the same height as the Statue of Liberty. This rainforest is also home to Bunya Pines, another massive tree that can reach 40 meters in height. A trip to the Daintree Rainforest is the closest thing you can get to hopping inside a time machine, so it makes sense that you’d find some of the most ancient examples of early flowering plants only here. These are incredibly valuable to our understanding of how flowering plants first developed, and are fascinating in their own right too. The locals have found 12 of world’s 19 primitive plant families in the Daintree Rainforest. The Idiospermum – commonly referred to as the “idiot fruit” – is one of the oldest forms of flowering plant that is found only in the Daintree Rainforest. Some also refer to this tree as “the green dinosaur”, as it probably dates from 120 million years ago. This makes it almost twice as old as the famous Tyrannosaurus Rex. Most of all, the Daintree Rainforest is absolutely gorgeous. Streams, waterfalls, vividly colored animals and exotic plants meet white sandy beaches and the achingly breathtaking ocean at the north Queensland coastline. Only 2 hours drive from Cairns, it’s rare that such a largely untouched wilderness can be so conveniently located by the comforts and amenities of civilization. Seeing this part of the planet up close and personal is definitely one for the bucket list. Though the Daintree Rainforest remains fairly untouched as compared to other lowland tropical rainforest areas around the world, there are unfortunately several serious threats to this irreplaceable part of the world. Climate change poses a huge threat to the Daintree Rainforest. Even just a one-degree change in average temperature in this part of the world could see many important species lose huge parts of their habitat here. This would impact the rest of the rainforest ecosystem. Extinction also threatens the area – a vast number of plant species in this rainforest are either entirely or mostly reliant on just one endangered bird. Introduced species present further problems: feral animals prey upon natives and compete with them for food sources, while weeds compete with and replace native plants, which reduces habitats for native animals. 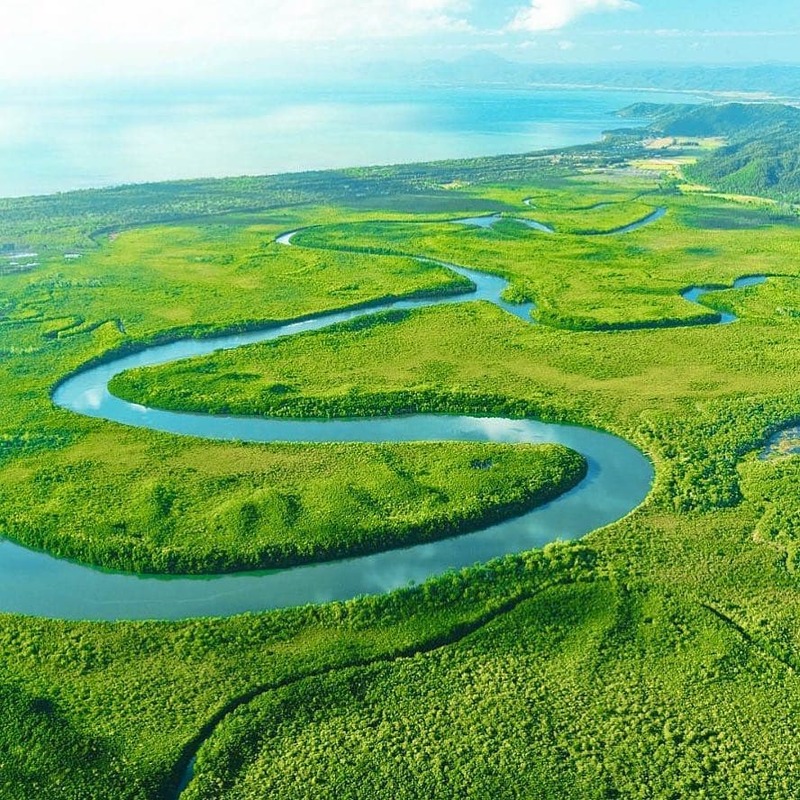 The Daintree covers a huge expanse of the country from rainforest to beach, river to the ocean. It’s a nature lover’s ideal getaway with some adventure filled activities to go along with it. There’s no right way to explore this region, however, there is some experience that should not be missed. Have a look at all the different tours on offer because they are extensive and are often led by the people who know the area and the animals best. There are many activities in here such as horse rides along Cape Tribulation, Sea Kayaking to Snapper Island National Park and all sorts of cruises so you can view the region both day and night. Start your Daintree experience at the Daintree Discovery Centre. 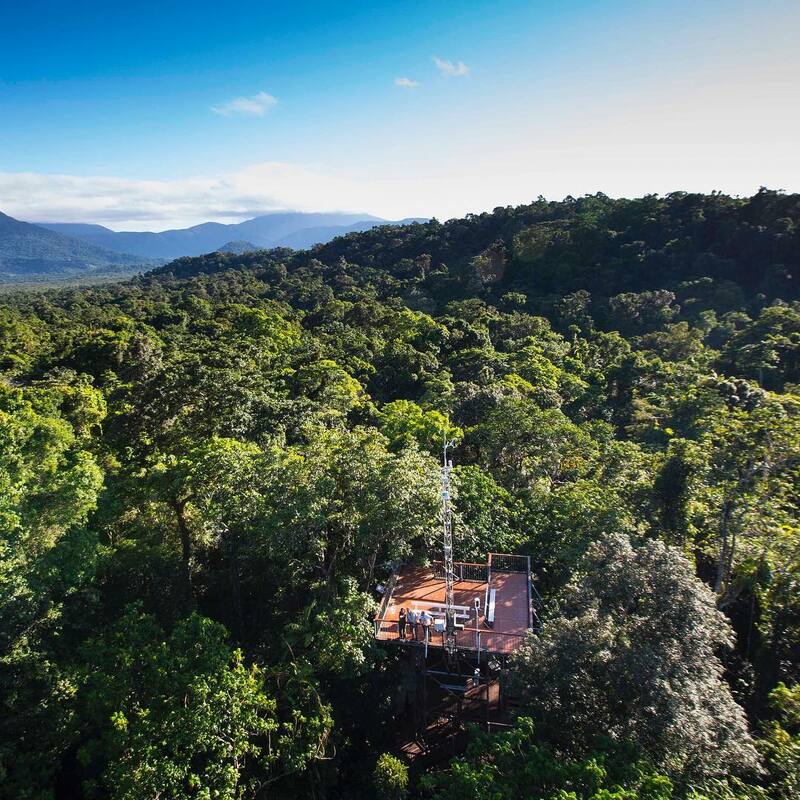 Here you can learn all about the origins of the ancient rainforest before heading out onto the series of aerial walkways and viewing platforms connected to the center. This allows you to easily explore all levels of the rainforest up close, from the forest floor to the uppermost reaches of the canopy. Take a cruise on the Daintree River and look out for saltwater crocodiles. Several operators offer tours of varying length, from one hour to half day cruises. This is an excellent way to see and photograph Daintree’s incredible wildlife at close range, in one of the most beautiful forest environments on the planet. 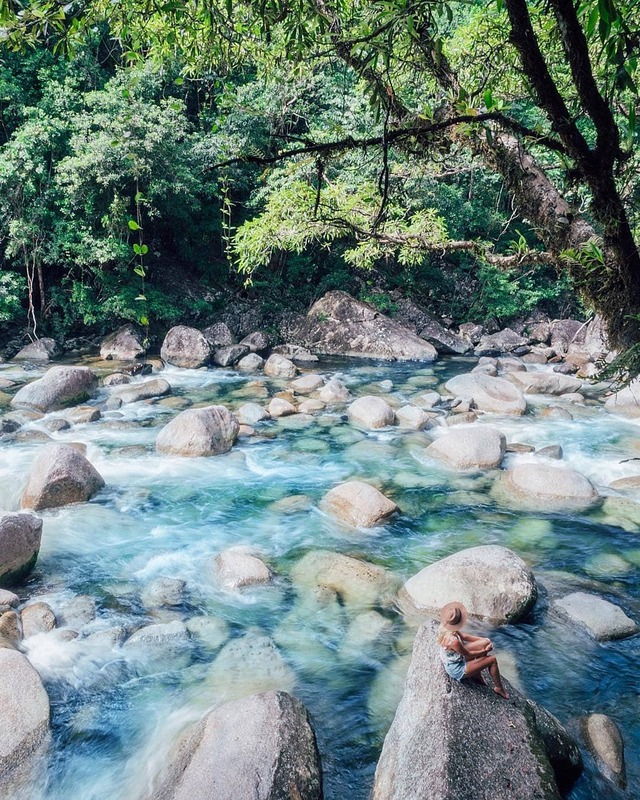 Within Daintree National Park lies the magnificent Mossman Gorge, where clear waters cascade over granite boulders in the Mossman River, creating freshwater swimming pools. There are no crocodiles here, but you should check that conditions are safe for swimming beforehand, at the Mossman Gorge Centre. Take a stroll along the boardwalk through the lower rainforest canopy and return along the riverside track, enjoying views from lookouts along the way. Fly through the trees on an exhilarating guided zip-line tour with Jungle Surfing Canopy Tours. You’ll glide through the different levels of the canopy in a harness attached to a cable, with bird’s eye views over the treetops, down to cascading streams and out to the Great Barrier Reef. 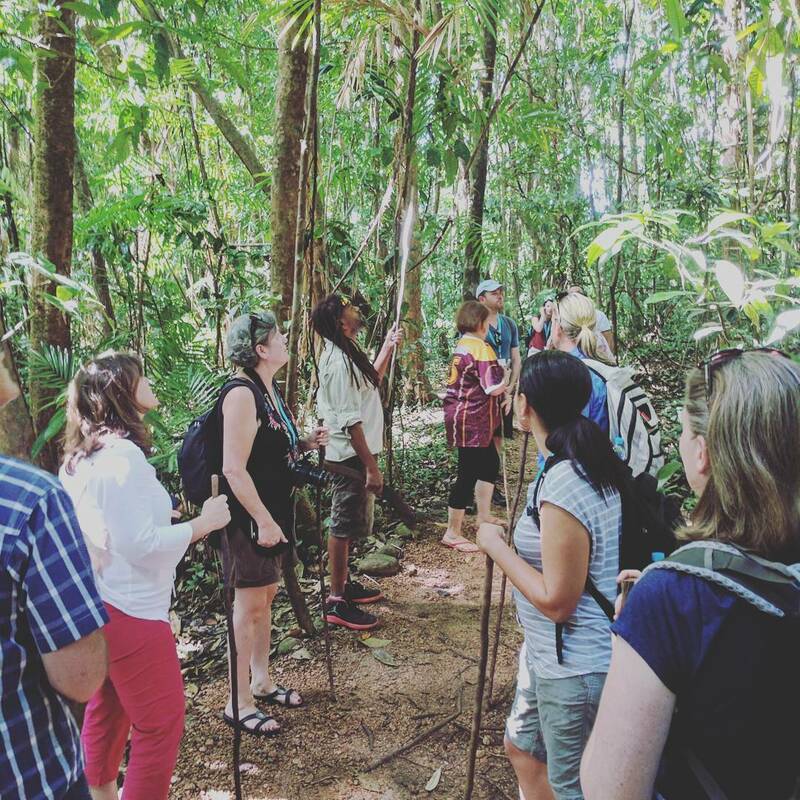 The Aboriginal Kuku Yalanji people of the Daintree region offer authentic, award-winning, guided walking tours of Mossman Gorge that are a must-do for anyone who visits. The Ngadiku Dreamtime Walk includes a traditional smoking ceremony, historical and cultural insights, spear throwing lessons and information on how the Kuku Yalanji people have used the rainforest for food, medicine and shelter for more than 9,000 years. Enjoy bush tea and damper (a simple Australian form of bread) at the end of the tour. Explore the delightful Daintree Village and its unusual stores. The store sells local arts and crafts including handmade pottery, textiles, produce, souvenirs and tropical clothing. Visit an Aboriginal art center, Janbal Gallery, which features Aboriginal artifacts and art. You can even experience a private Aboriginal art lesson and take your work home. 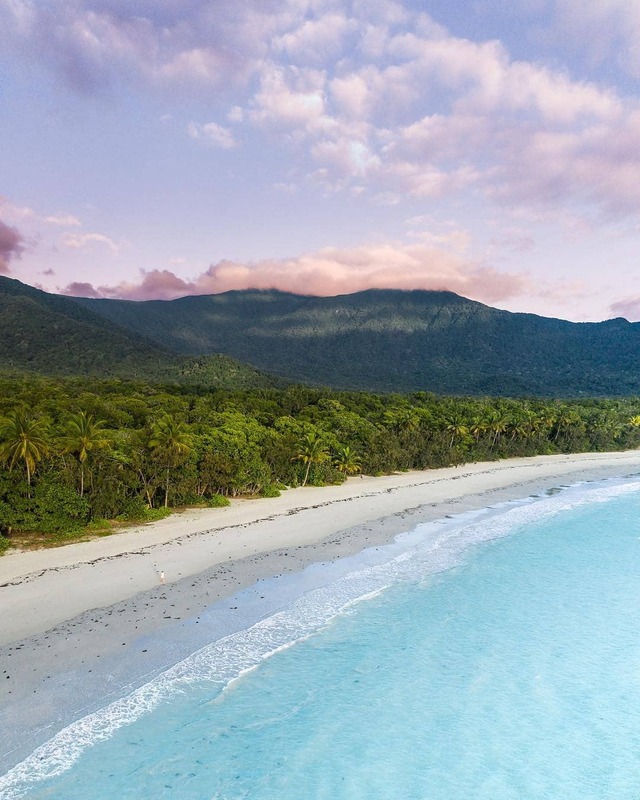 Head to the village of Cape Tribulation, the meeting place of two World Heritage sites (the Daintree Rainforest and the Great Barrier Reef). Explore the gorgeous scenery, beautiful beaches, and rainforest walk. The journey to get here is part of the experience – you’ll take your car across the river on the Daintree Ferry, and pass through amazing rainforest scenery and wonderful views of the coast. You might also spot an endangered cassowary during your visit. These elusive flightless birds can stand up to two meters tall and are arguably Australia’s most spectacular feathered species. The Daintree Rainforest is not a dangerous place to visit, but like any tourist attraction, it is important to take care and follow some basic guidelines to ensure the safety of everyone. Danger can be avoided if you take note of safety warning signs and do a little research ahead of time. 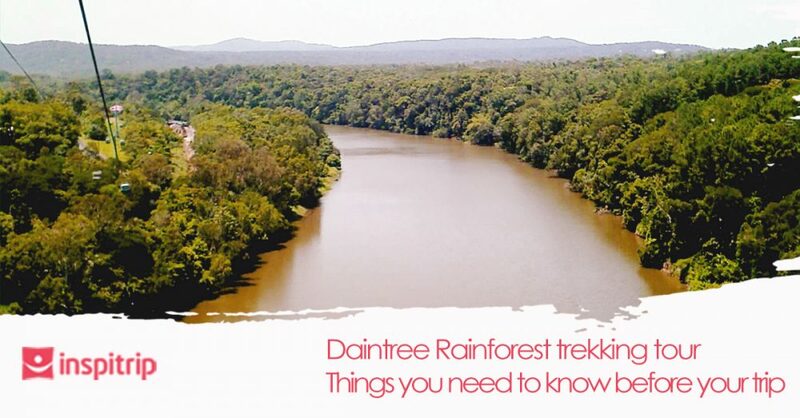 Here are six Daintree safety tips that will help make your Daintree visit safe and enjoyable. We recommend that you don’t go walking in the rainforest by yourself. Especially if your fitness level is towards the lower end. 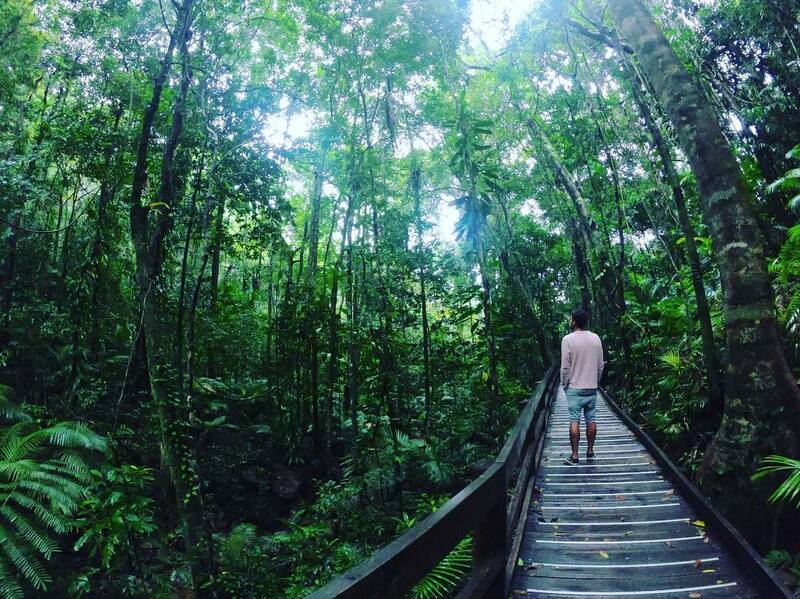 If you want to explore, join a guided Daintree Rainforest tour or bring along a buddy. If you are going to hike, let someone from your accommodation know where you are heading. Just in case you are gone for longer than expected. So that the authorities can raise the alarm if they have any concerns about your safety. Please note that there is no mobile phone reception in the Daintree Rainforest. Exploring the rainforest may require a lot of walking or other physical activity; the Daintree is full of adventure such as jungle surfing, horse riding, kayaking and more. Always bring plenty of drinking water to help you stay hydrated. Bottled water is available from the bistro or local convenience store. There’s also clean drinking water throughout the resort. Never swim in fresh or seawater unless you’re sure it’s croc free! Be mindful of crocodile warning signs around. If you’re unsure, ask for advice from our staff at the Beach House. We are used to letting visitors know where and when it is safe to swim. Certain times of the year, the waters are filled with stingers and other sea creatures that can hurt you (if you get too close). If you want to explore the magical Great Barrier Reef. Ocean Safari offers underwater reef tours, where you can safely swim with giant sea turtles, clams, fish and many other sea creatures. If boat trips and snorkeling is not your style, come and enjoy a drink or two by the pool and a maybe even a swim under the ancient trees of the Daintree Rainforest. Use mosquito repellent before going out, especially at night. Wear proper protective clothing such as long-sleeved shirts or pants and fully closed shoes if going on a hike. Cover yourself as much as you can to protect yourself from ants, leeches and the sun. Most animals in the rainforest are harmless if you just let them be. There have been no snakebite cases but we always remind our guests to take extra care. Rainforest spiders are fascinating but we advise guests not to touch them. The beloved Cassowary bird is adorable but does not try to go near them. Because they can attack when threatened. Listen to the advice of tour guides and locals and you’ll be fine. Are you ready to experience the Water Rafting in Cairns?